Today..S winds 10 to 15 kt, becoming sw 20 to 25 kt with gusts up to 40 kt. Seas 4 to 6 ft, building to 5 to 8 ft this afternoon. NEar shore, seas 3 to 4 ft, building to 5 to 7 ft this afternoon. Dominant period 5 seconds. Adjacent sounds and rivers a moderate chop, increasing to rough. A chance of showers and tstms this morning, then showers and tstms this afternoon. Tonight..W winds 25 to 30 kt with gusts up to 40 kt, becoming nw 20 to 25 kt after midnight. Seas 5 to 8 ft. Dominant period 7 seconds. Adjacent sounds and rivers very rough, diminishing to rough after midnight. 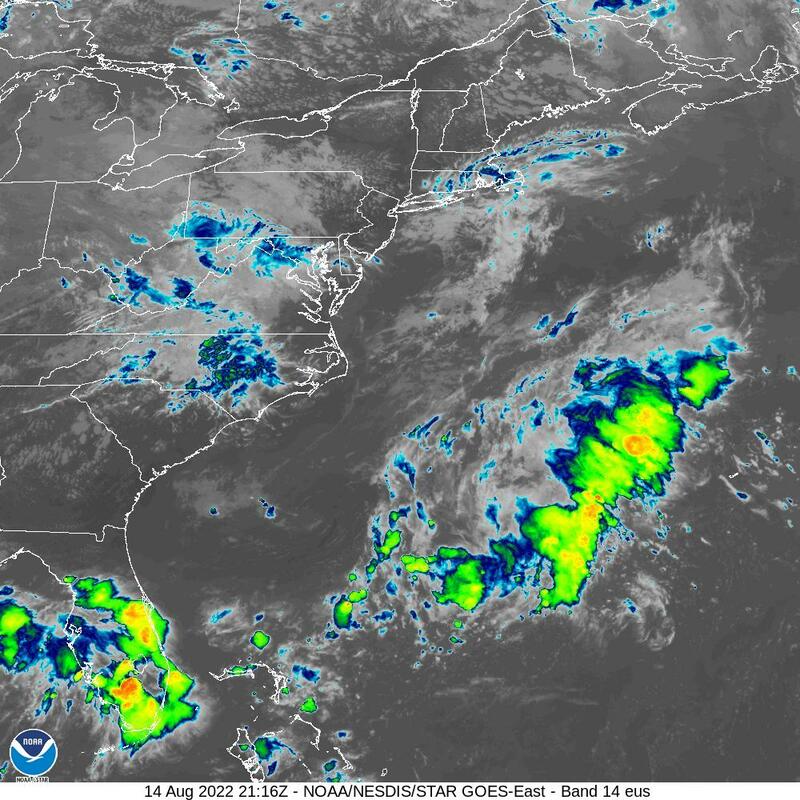 Showers and tstms in the evening, then a chance of showers after midnight. Sat..NW winds 15 to 20 kt, becoming W 10 to 15 kt in the afternoon. Seas 4 to 6 ft. NEar shore, seas 3 to 5 ft, subsiding to 2 to 3 ft in the afternoon. Dominant period 7 seconds. Adjacent sounds and rivers choppy, diminishing to a moderate chop in the afternoon. Sat night..SW winds 10 to 15 kt. Seas 2 to 4 ft. Dominant period 4 seconds. Adjacent sounds and rivers a moderate chop. Sun..SW winds 15 to 20 kt. Seas 2 to 3 ft, building to 3 to 5 ft in the afternoon. Adjacent sounds and rivers choppy. Sun night..W winds 15 to 20 kt, becoming N 10 to 15 kt after midnight. Seas 3 to 5 ft. Adjacent sounds and rivers choppy, diminishing to a moderate chop after midnight. 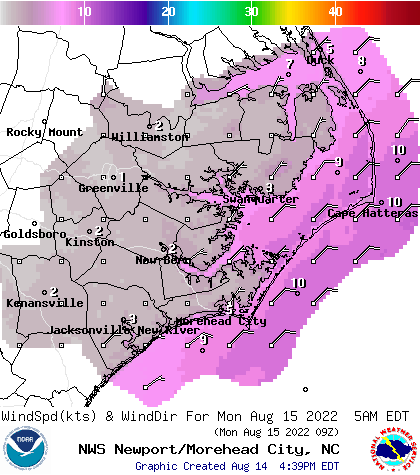 Mon..NE winds 15 to 20 kt, becoming se 5 to 10 kt. Seas 2 to 4 ft. Adjacent sounds and rivers choppy, diminishing to light chop. Tue..SW winds 5 to 10 kt, becoming S 10 to 15 kt. Seas around 2 ft. Adjacent sounds and rivers light chop, increasing to a moderate chop. Winds and seas higher in and near tstms. environmental winds of 45 to 50 kts between 5 and 7,000 feet. front with lows falling back into the lower 50s inland. like a nice weekend, with dry conditions and seasonable temps. the area mid to late next week and will continue sc pops. showers and thunderstorms will move through the terminals. 15 to 25 knots with gusts to 30 kts over most of the waters. bit late tonight to 5 to 8 feet by daybreak Saturday. through Sunday evening with winds becoming nne 15 to 25 kt. from previous forecast based on better agreement in guidance. 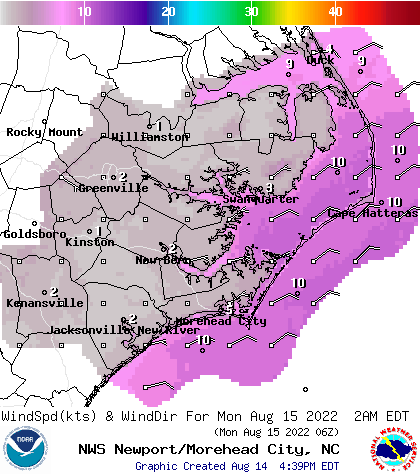 or greater Sun night and Monday morning, ESP north of ocracoke. winds 10-15 kt return Tue with seas 2-3 ft.